This is my method, I’m sure there are others. 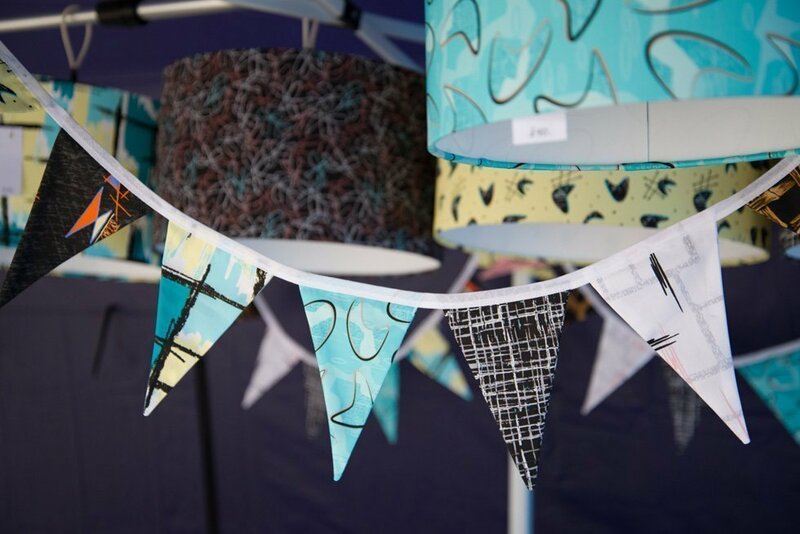 I like mine to be double sided and also to be hardwearing because it gets used over and again on my stall (picture on right above), whereas I know some people just cut out triangles with pinking shears and stick them to tape. So you don’t really even need to be able to sew! 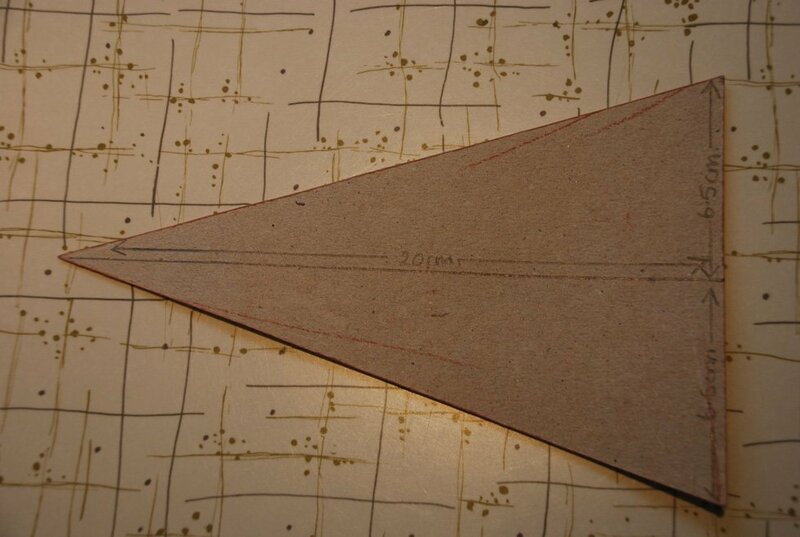 To start with I cut a cardboard template so that all my triangles are the same size. Mine measures 13cm across the short end and 20cm from the end to the tip. Draw out your triangles with tailoers chalk. 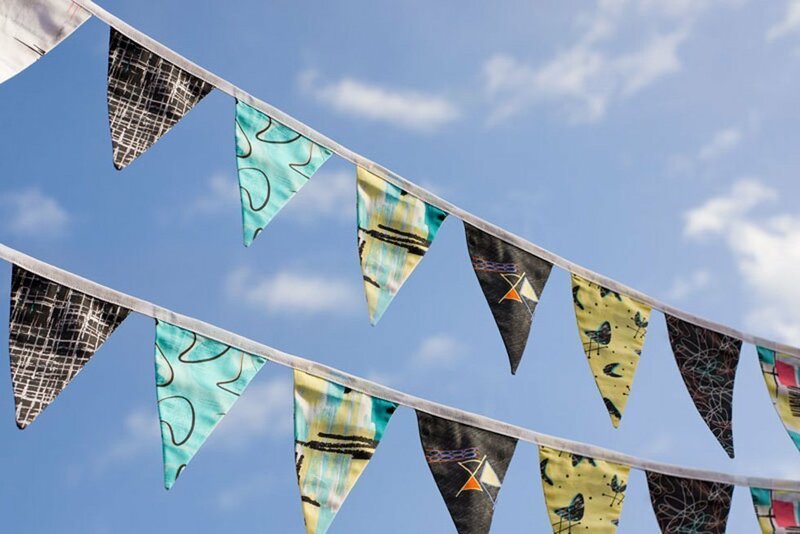 You will need two triangles for each finished one.If you are clever with your fabric cutting you can draw out your triangles so that they all tessellate together and you have less fabric wastage. I’m sure I have a photo somewhere of my fabric laid out and the shapes drawn like this but do you think I can find it now I need it? Nope. Then take two triangles and with right sides together sew up one long side, pivot at the top and sew back down the other side. As shown on this red triangle. 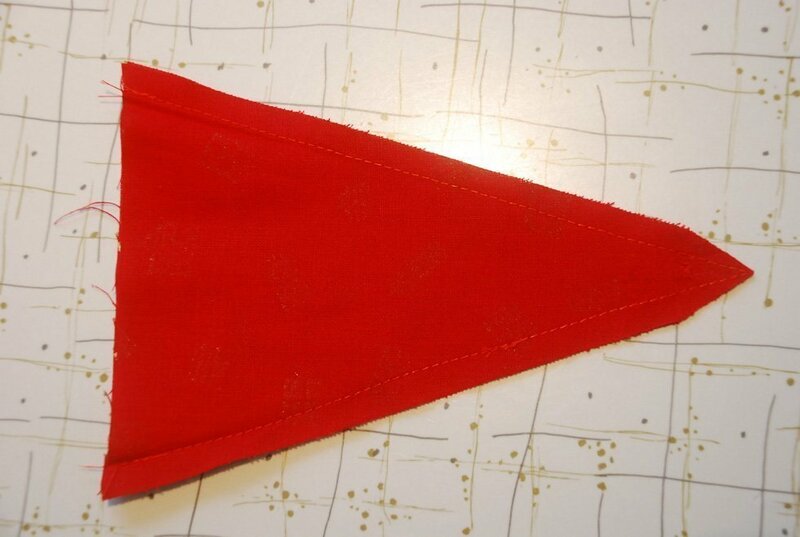 The next thing is to trim the excess fabric from each side at the pointed end (see pic above). This will make the finished piece look much neater since there will be less bulk inside the pointy end once it is turned the right way out. I have a little gizmo for turning collars that I use and it makes it so much easier. 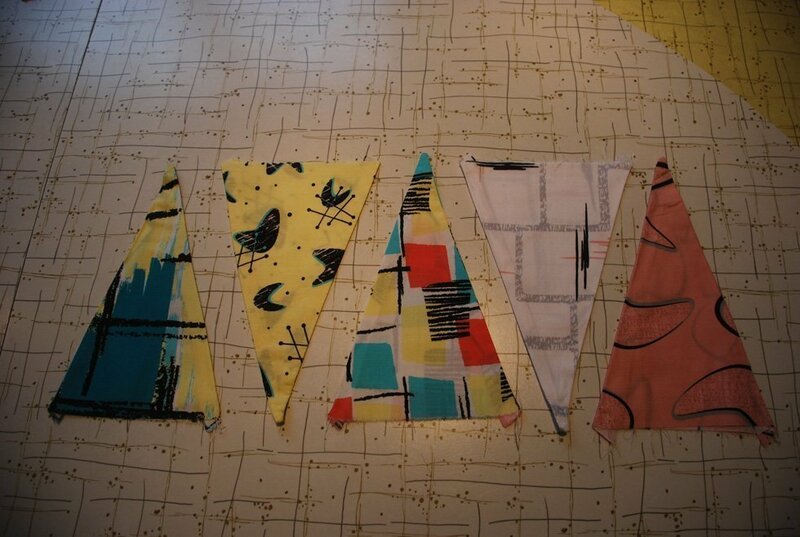 The last thing to do is to attach all your neatly sewn triangles to a tape of some sort. For my Christmas ones I used inch wide silver ribbon and for my 20th Century Cloth stall ones I just used plain white bias tape. 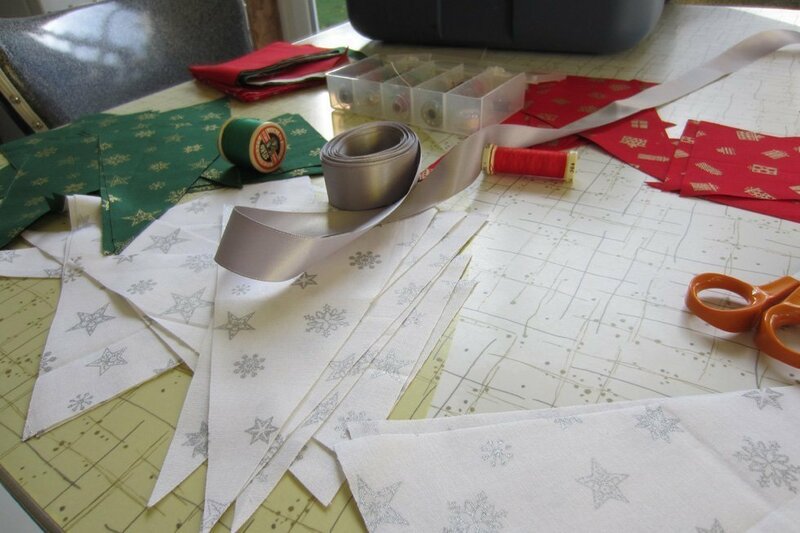 Whichever you choose to use fold the tape in half and iron it then lay it out and place your triangles evenly spaced so that the unstitched open end is enclosed in the fold of the tape and pin them in position. 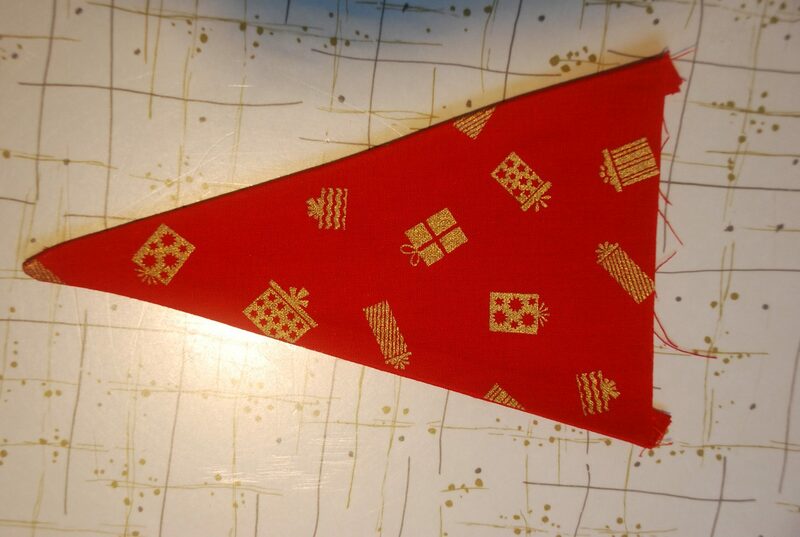 Then just stitch along the folded tape so that the stitching catches the triangle inside the tape. There you go finished, enjoy!